I saw a post yesterday about a seed that I had forgotten about that I wanted to grow. The 819 Radach (1655 Ford x 2009 Wallace). Joe Scherber grew this seed two years ago. When he said he was growing it, I have to admit that I said, "huh?" Obviously not a big pumpkin at 819 pounds and it wasn't listed as a damaged pumpkin, so it had grown to full-size, so I couldn't figure out why Joe was giving it dirt. Then I got the back story. Matt grew three pumpkins in 2014. One was a 1655 Ford and another was a 2009 Wallace. The 1655 Ford seed was one that probably should have seen more dirt. Joe grew that seed previously and set a new Colorado state record from it. An aggressive plant. I think he and Matt were the only two to grow it. The 2009 Wallace is probably the greatest seed of all time and has grown multiple world records. 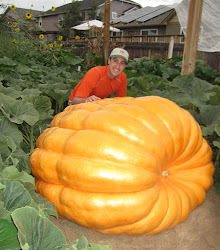 What makes Matt's pumpkins very interesting is the fact that he grow both pumpkins on only 290 square feet! Less than half of what most growers plant sizes would be. He has limited space and literally had vines wrapped around bushes. The 2009 Wallace grow a 1,223 pound pumpkin. That is 51% bigger than any pumpkin he had grown previously (which is a number that I think is worthwhile looking at when considering which seeds to grow). Makes you wonder how big that pumpkin could have gotten if it had more space. Joe grew that 819 seed to 1404 pounds. An aggressive plant. Andy Corbin grow the seed from the 2009 Wallace pumpkin and grew a personal best from it. The genetics are in there. I'll have my son or daughter grow the 819 seed. I really like those Barron seeds, but they haven't produced anything as big as the mother and progeny from the progeny haven't produced anything as big as the mother either, so the genetics are good, but nothing that seems to want to grow a world-record sized pumpkin. I think the 819 has shown a little more oomph and have shown to be a able to grow at altitude.